Nitro Circus is coming to South Africa this summer, with the high-adrenaline tour kicking off in Cape Town on Saturday, 21 October. The global extreme sports phenomenon will bring an all-new show with them, filled with world firsts, spectacular tricks and mind-blowing stunts. 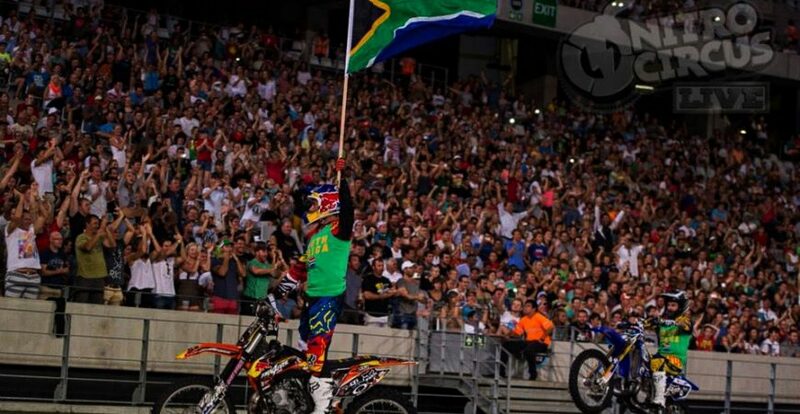 To add an even more exciting element, extreme sports icon Travis Pastrana, who couldn’t take part in the 2014 event, will join this summer’s tour, and will ride in South Africa for the first time. Dates and venues for this extravaganza are as follows: Cape Town: Saturday 21st October at Cape Town Stadium, Durban: Wednesday 25th October at Moses Mabhida Stadium, Johannesburg: Saturday 28th October at FNB Stadium. Join Beluga Sport and Entertainment in one of our VIP facilities for the absolute best view of this adrenaline-fueled showcase.